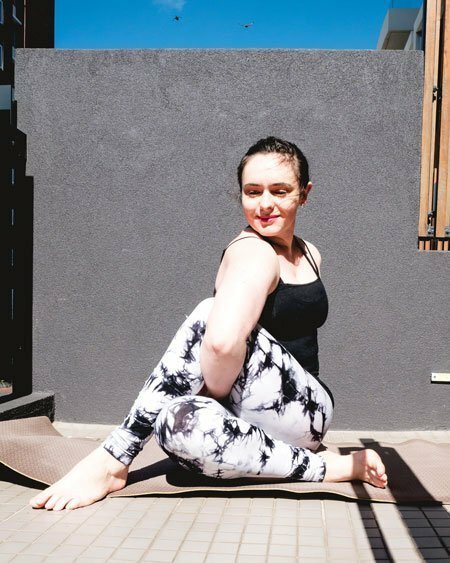 The many benefits she receives from practising yoga inspired Dr Michelle Middleton of Star Health in South Melbourne, VIC, to become a yoga teacher. “I started yoga when I was about 16 and have been practising it ever since. When I immigrated to Australia from the UK four years ago, the first thing I did was find a yoga class. Fortunately, Melbourne has hundreds to choose from. “I’ve tried a lot of different types of yoga but, at present, I’m into yin yoga. I go to classes at least once a week and have trained to be a yin yoga and hatha yoga teacher. Hatha yoga is considered the more traditional style of yoga where you don’t need to move very quickly. Yin yoga is based on Chinese medicine and working into the fascia in the body. Poses are held for much longer and it uses a completely different set of poses to hatha or vinyasa yoga. “There are many benefits from doing yoga. It increases flexibility and strength, gives you more energy and is an excellent form of stress release by cultivating mindfulness. For dentists—renowned for developing musculoskeletal problems—yoga can be very beneficial in maintaining physical and mental health. “I’ve taught yoga in studios, gyms, at people’s homes and at the Melbourne Sports and Aquatic Centre. I am currently involved with a research organisation called the eviDent Foundation that facilitates dental research in a practice-based setting. Its aim is to encourage relationships between practitioners and academic researchers. eviDent facilitates and supports dental practices to produce and disseminate evidence that can translate into practice and inform policy. “The organisation exists on tax-deductible donations and in-kind support. I donate my time and expertise by offering a monthly Vin Yin and Vino session. The session involves 30 minutes of vinyasa to increase energy, followed by 30 minutes of yin relaxing into the deepest layers of the body. We wrap up the evening with a glass of vino. All proceeds go directly to supporting eviDent’s vital research. “I recently changed jobs so I’m just concentrating on yoga associated with eviDent at the moment. When things settle down, I might start teaching at a studio again. It can be difficult juggling full-time dentistry and running yoga classes. Visit www.evident.org.au for more about the eviDent Foundation or register to attend a Vin Yin and Vino session.